Portions of herbs are weighed on the old scales and added to piles, ready for sale. If you walk past this place, you are bound to notice the smell – an ancient and magical scent. Outside is a sign that says ‘Oldest Herbs Shop’, though its actual name is Nguan Choon Tong. Inhale deeply. Thalang Road is my favourite street in Phuket. There's history here, and a very different kind of Phuket compared to the beaches. Tourism does have some influence, there are more little cafes and guesthouses here than there were 10 years ago, but a lot of the tourists that come are Thai. Thalang Road has also been spruced up, with the most noticeable thing being the lack of overhead cables. I love the old shophouses, the wooden shutters, the mix of Muslim and Chinese businesses, some of which have been on the street since the early 20th century when this area was built. The herb shop opened in 1917, opened by the grandfather of the current proprietor. It's a family business run by the Bumrungwong family who also own the buildings either side of the herb shop, both of which are restaurants. On one side is Wilai, the other side is Kopitiam. I was in Kopitiam a couple of weeks ago. One of the family running Kopitiam is Wiwan, great granddaughter of the man who opened the herb shop. Her uncle, Wisit Bumrungwong, runs Nguan Choon Tong now. I asked Wiwan to ask her uncle for permission to take some photos, as he’s not overly keen on tourists snapping away in his face. It was a good time to take photos, as Khun Wisit, assisted by his wife and son, was preparing medicines. Portions of herbs were being weighed on the old scales and added to piles, ready for sale. I am quite amazed that business is still strong. Doesn’t everyone use modern pharmacies now? At least in the Old Town, Chinese herbal medicine is still popular. 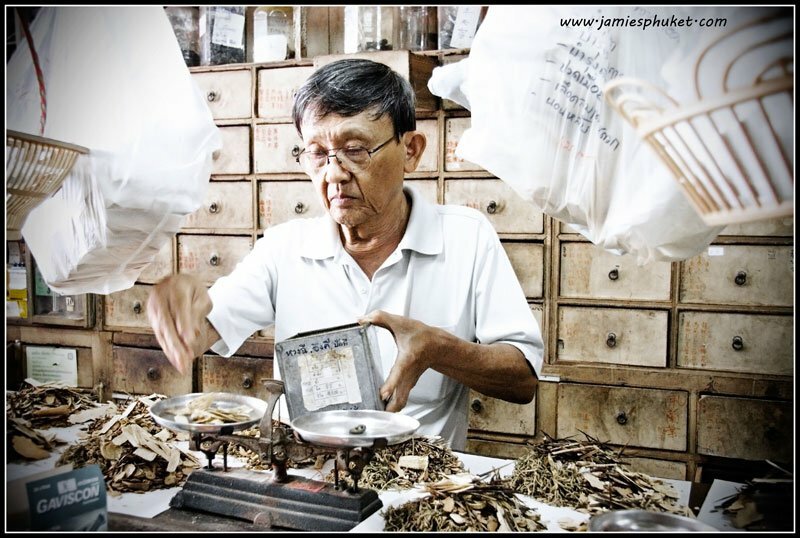 The knowledge of Chinese herbal medicine has to be handed down to the next generation. Khun Wisit sometimes still asks his father, Khun Narong Bumrungwong, for advice. Khun Narong lives next door, at Kopitiam. Only a few of the family live here now, but until 30 years ago, the herb shop was a home and business. It was a typical shophouse. No commuting to work necessary. Old Phuket Town is actually not so old. Most of the buildings were constructed in the early 20th century as Phuket Town became the new centre of commerce for the island, with business driven by the tin mining and the rubber industries. That’s when Phuket became important. And Nguan Choon Tong herb shop was right there to catch the wave. The old Chinese traditions are very evident today. There are Chinese shrines all over town, and festivals like the Phuket Vegetarian and Hungry Ghost Festivals show that the traditions are not lost. And the herbs live on too.